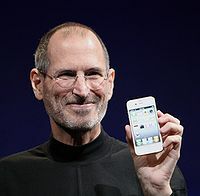 Steve Jobs (above) is not just a product entrepreneur, he is a category inventor. Steve creates products that are 'category killers'! Apple, Mackintosh, i-pod, i-phone, i-pad ... all these products are about a new category of products. Steve's success lies in making products that meet new customer needs. He has the knack to identify the market gaps, fill them, and succeed. Entrepreneurs aim for mega successes. They look for concepts that create something new, redefine the present, set new standards, help gain a leap in sales and provide a higher platform of performance. From where do such mega successes come? The nub of the matter is that mega success comes from category killers as illustrated above. Category killer is a brand, product, company or service that has a distinct sustainable competitive advantage that competing firms find it almost impossible to operate profitably in that industry. There is of course another meaning to this term: large retail chains like Wal Mart that put other smaller retailers out of business are called category killers. However, in marketing and strategy, category killer is a group of products or a product that delivers superior value and creates a category in the market. A category killer redefines the market. Oral insulin is another example of a change champion product that can become a category killer. Biocon is working on this concept. If oral insulin becomes a reality, Type 2 diabetes mellitus becomes easier to manage, similar to thyroid disease, where oral thyroxine tablets are given. Just imagine, if management of thyroid disease was possible only through injectable thyroxine what a painful disease hypothyroidism would have been. It is difficult to create products that have superior value that can create a new product category market. Hero Honda continues to be the evergreen example of a product that has created a new category in the market, leading to its triumph in the motorcycle market. Steve Jobs seems to have perfected the art and science of hitting the market regularly with new categories of products backed by savvy marketing. Simply put, innovation is doing something new that is useful. It takes an interdisciplinary approach to do it. And innovation depends on competition. The need to innovate comes from the desire of an organization to exist in the market. Today, the pharmaceutical industry and marketing is a demystified place. People know the tricks of the trade. There is a thriving ecosystem that provides products, this has led to commoditization, and a plethora of brands. Hence, in the Indian pharma market place the need to innovate is felt as never before. Innovation to try and create new product categories is becoming a vital strategy in the Indian pharma industry. Thnks for reading, pls scroll down and read all other posts, clik on older posts as and when required, and kindly recommend this blog to ur acquaintances. this is very good thougt specieally for medical representative who want to create imege in his market also for companies.